Speeding is a category of reckless driving. Speeding is defined as exceeding the posted limits or driving too fast for conditions. It is one of the most common traffic violations. 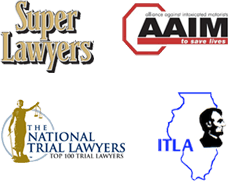 As experienced Chicago injury lawyers we have handled thousands of car accidents that involve speeding. Drivers that speed cause thousands of accidents every year in Chicago. Some of them leave the victims seriously injured or dead. It is a known fact that excessive speed causes the driver to have less control of the vehicle and a limited reaction time. A rapid reaction time is crucial when driver's experience changes in road conditions, weather or traffic. Severe or catastrophic injuries can result when a driver is unable to react to changes due to a high rate of speed. If you were injured as a result of a speeding accident, hiring an experienced Chicago speeding accident attorney is vital to determining fault in your case. Fault is one of the most critical elements in a car accident claim. The individual at fault is the person whose negligence caused the accident. Typically, this person who is responsible to pay for the damage caused by his or her negligence.